Come to the First Flight High School in Nags Head NC for the Outer Banks Wedding Weekend Expo to experience all things wedding. Explore venues, wedding vendors, restaurants and sample the food, hospitality and entertainment available throughout the Outer Banks during the Wedding Tour. This 2-day expo and wedding tour is sure to be an exciting event for everyone in attendance! Enter to win our Dream Wedding, Dream Honeymoon and other Dream Giveaway Packages. During Wedding Weekend, there will be numerous offerings of discounts through our Wristband Benefits program. Stay tuned for a full list of participating members and more discounts! Outer Banks Attractions/Activities, Hotels, Restaurants, Reviews, etc. 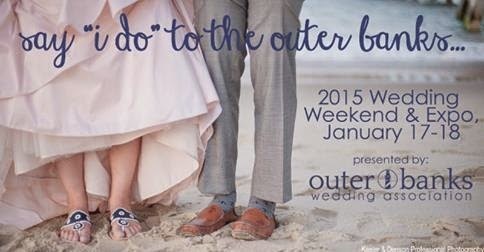 Meet, greet, and book premiere vendors and venues at the Outer Banks Wedding Association's 17th annual wedding weekend and expo, January 17-18. There will be a fully-paid for dream wedding and dream honeymoon given away! Brides and attendees can take advantage of our Wristband Benefits program, whereas vendors will be offering discounts and deals through the weekend. Presented by the Outer Banks Wedding Association, a non-profit organization of nearly 300 members that help make your destination wedding as easy as a day at the beach.